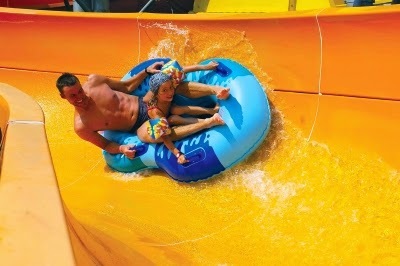 Bulgaria Aquaparks - Treat The Kids This Summer! Going to an Aqua Park must be one of the most universally loved activities for children and a great way to keep cool in the sun. If you want to make it part of your holiday in Sunny Beach then there are several options within easy reach of the resort. Spread over 24,000 square metres, this wonderland of all things water-related has something to suit every member of the family - children and adults alike. The younger kids can benefit from a large shallow pool, but won't be jealous of their older siblings, as it has its own attractions. These include a wrecked pirate ship with two small slides leading into the oval pool, as well as a lifesize toy crocodile to climb on and three replica turtles. Older kids will no doubt want to get their adrenaline pumping, such as the vertical Kamikaze and the bendy Hydrotube. Many adults appreciate being able to have a good swim, so the full length pool is particularly popular, but don't be fooled - it holds a secret. A special sound system plays music underwater so you have tunes to keep your pace up. At the end of the day, gather all the family members together and race each other down the four lanes of the Multislide. It's amazing how competitive dads can get! This is probably the flashiest of all the Aqua Parks in the Balkans and the biggest. There are over 40 attractions in a 46,000 square metre space, including a large castle, from which many of the slides emerge and disappear. Some of these snake and wind all over the park, giving a great bird's eye view of the surroundings, while others are completely dark or decorated in a zebra print pattern. 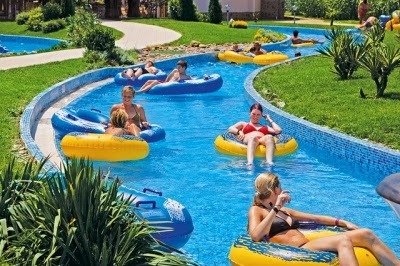 There are also two smaller Aqua Parks in the very heart of Sunny Beach that are cheaper. They have fewer of the high profile fast flowing rides, but could be good for younger children. One is the Kuban Aqua Park in the gardens of the Hotel Kuban and the other is the Pirates of the Caribbean Mini Aqua Park, which can be found within the vicinity of the Hotel Kotva. Attraction Park 'Aquapolis' is considered the most beautiful Aqua Park in Eastern Europe. This paradise is situated on area of 30 000 sq. km. to the west of the seaside resort Nessebar. This truly magical Aqua Park is located in the western part of the Albena resort between Variety Casino and the Hotel Ralitsa, covering an area of about 30 acres within the park area. Aquapark Aquamania features a variety of high quality water slides including the family adventure and family thrill Mammoth, The Plummet, 4 Lane ProRacer & Kidz Zone. Free entrance to the Aquapark Aquamania is included for guests to the resort staying at selected hotels, food and drinks are at local charge. Kids love Aqua Parks and Bulgaria has a great selection to choose from. Secure your next summer 2015 or 2016 holiday to Bulgaria now by visiting our website.